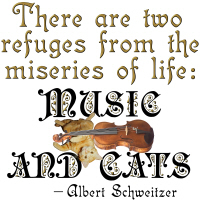 Albert Schweitzer’s famous quote is sure to resonate with cat and music lovers everywhere. The text is shown intermingled with the images of a viola and a playful orange tabby cat. Now you can own this delightful quote (or give it away to your favorite ailurophile and music lover) on your choice of fine giftware options as shown below! Buy it now on a t-shirt, hoodie, mug, tote bag or other quality gift or apparel item. Choose something for your favorite cat loving musician, exclusively from GearGems!